It is 11:50pm on Monday as I sit down to update the world (or the three of you reading this) about the great mission of God our team is privileged to play a small part in and what God is doing in our hearts through it. We just finished having a late night discussion in response to a great question by Chris Gruber about how ReachGlobal selects the families it does work for. It brings joy to my heart to have a serious conversation about things that matter with a small group of young men as they are wrestling with what God is teaching them through this experience. The morning alarm clock disrupted our sleep at 6:00am. Breakfast was at 6:30 with a devotional following that was led by Bud Riska (the construction project manager guy). Bud reminded us to set aside our expectations and prioritize relationships. We were given permission to focus on building relationships with the homeowners we would be working for and with people in the community we might meet. This meant the construction projects on the homes in the neighborhoods were to play second fiddle to the construction projects on the hearts in the neighborhoods. Great reminder for those of us who have a desire to “get stuff done”. 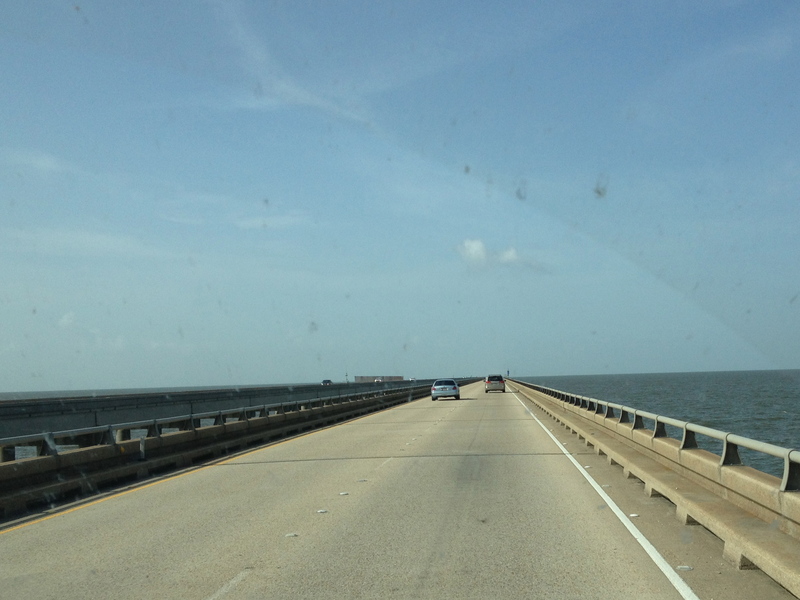 After loading up tools and getting organized and broke into 3 teams we departed from the Warehouse near Trinity Church in Covington to cross the world’s longest continuous bridge over water (The Lake Pontchartrain Causeway) which spans nearly 24 miles. 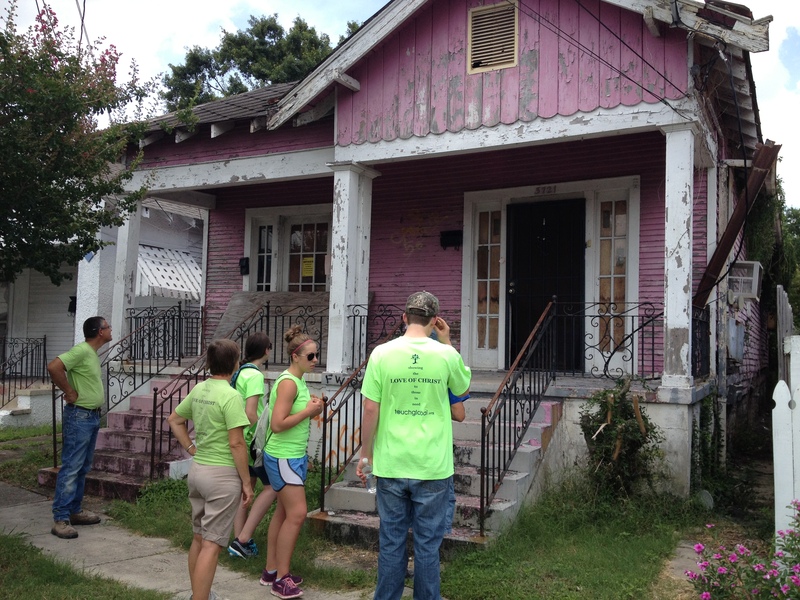 We entered the city of New Orleans and traveled separately to three different job sites. 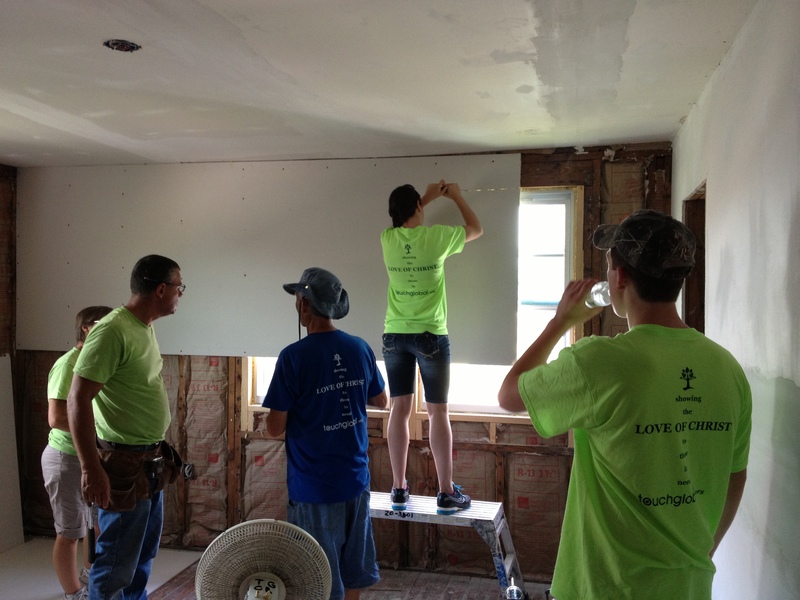 In future posts, I will share more about the various homeowners we are assisting and part of their stories. Some groups took time immediately upon arrival at the job site to walk through the neighborhood and pray for and with the people. The group I was with worked through the morning and after lunch took some time to walk and pray for the community. We met Darlene who is mental health care worker who was visiting some patients, particularly a woman whose 11-year old daughter had just arrived home on Friday following two months in the hospital due to brain surgery. We prayed together with Darlene and the mother and for her daughter. We walked past numerous homes that were boarded up and abandoned, though most in this particular neighborhood appeared alright from the outside. 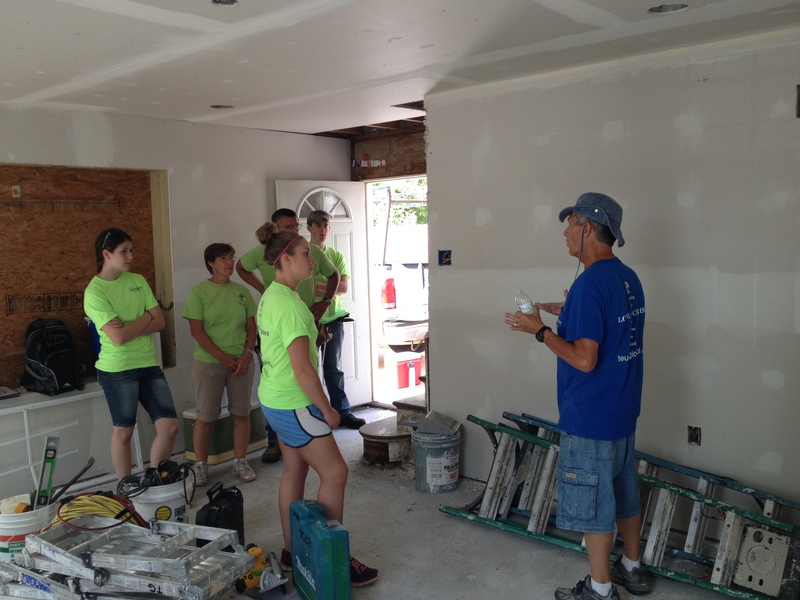 Two of our groups spent the day hanging sheetrock while the third group enjoyed being outside in the 90 degree plus heat and sun and humidity siding the house they were working on. On the return drive, I asked the question to those in our van what they would do if they were given the task to go to a community where there is no church at all and work to start a church. We discussed the value of making relationships and connecting with people. I was particularly blessed by the conversation we had with Blair and Joan who do missionary work in the jungles of Peru sharing the Gospel and planting churches that are led by the indigenous people. What a blessing to learn from a couple that has a heart for reaching the unreached – sharing the Word of God with people who have never before heard about the good news that, though we are sinners, God has made a way for us to be forgiven! We all returned to the Warehouse tired and dirty and hungry. Praise God for showers and good food and fellowship (and tough guys with soft hearts) Following supper we watched a short video about urban ministry that challenged us to think carefully about how we think about our role in what God is doing. This was a good reminder for me. I must set aside my desire to make a HUGE impact in New Orleans, and instead accept the rather minor role we are playing in something so much BIGGER than us. 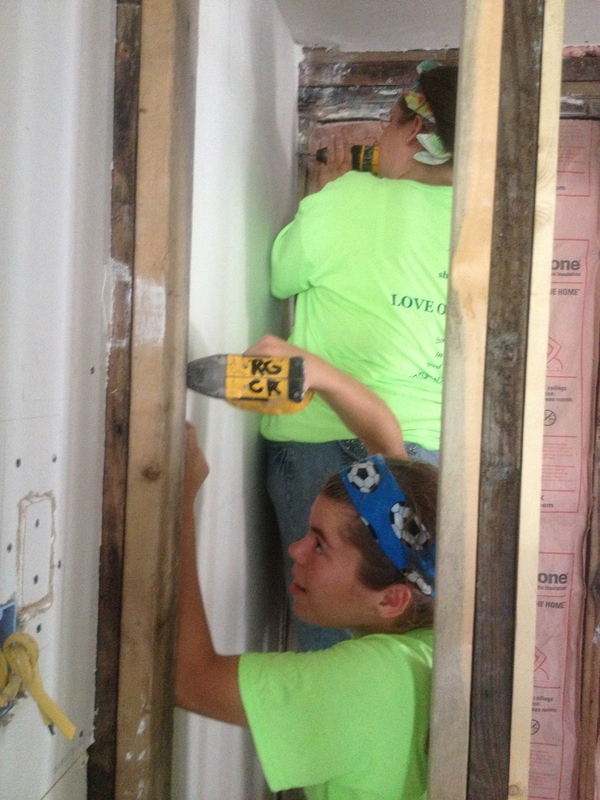 God is at work in New Orleans and God is at work in Barron County, WI. He has gone before us and we simply have the privilege of joining Him in the work on redemption He is presently doing in and around us. What a JOY to know that it is not about US, but it is about HIM. As my buddy JTB once said, “He must increase, but I must decrease” (John 3:30). May we be faithful in pointing people to HIM! “Love must be sincere. Hate what is evil; cling to what is good. Be devoted to one another in brotherly love” (Romans 12:9-10) This verse speaks volumes!!! 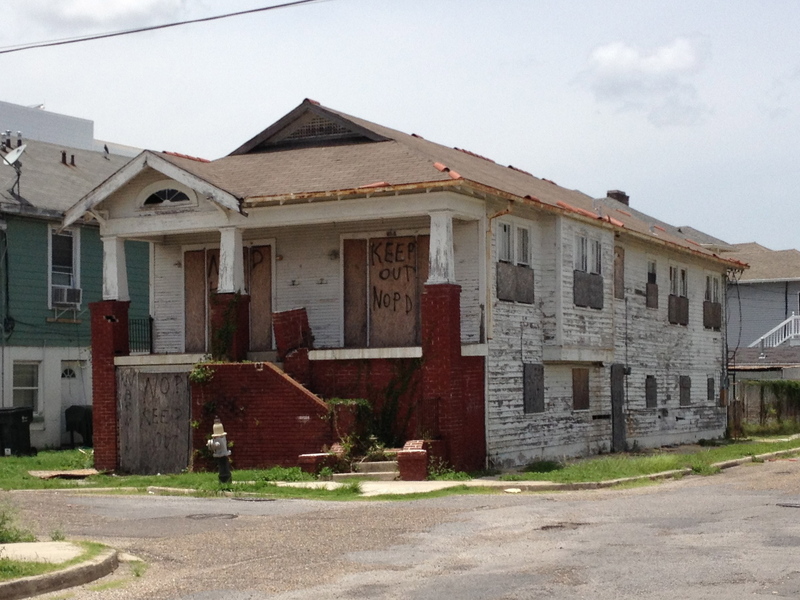 Just love the people of New Orleans and I promise God’s work will get done. God has an awesome plan for you all! I am so excited that you have been encouraged first to build relations and then build homes. Having that presonal touch means even more to all envolved and brings the heart to the center of your mission. 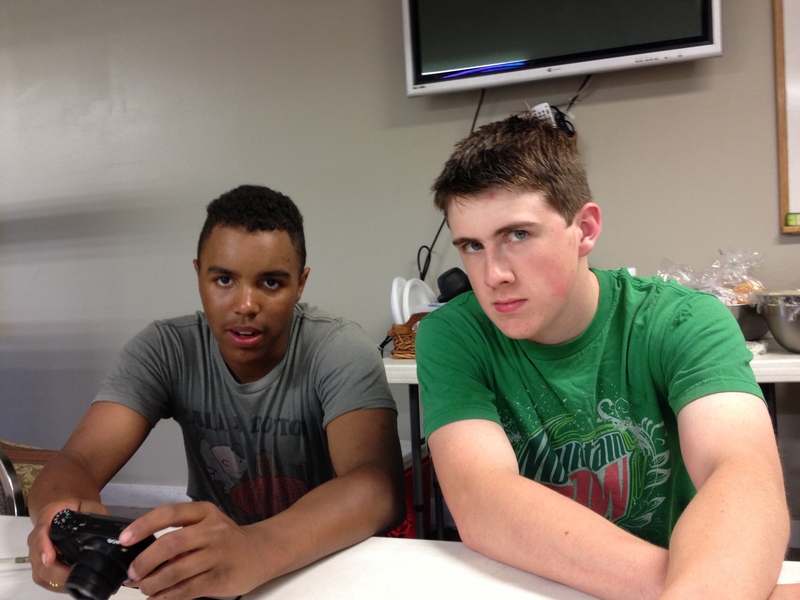 Know we are praying back home and wishing we could be serving along side of you!! !